A forest is termed as the large area of land covered with trees. There are also many terms which differentiate the forest such as tree density, tree height, land use, legal standing and ecological function. There is about 30 per cent of the land on the earth covered by forest. These forests are also life to many Flora and Fauna of various kinds that are living on the earth. Here we are listing the 10 most beautiful forests in the world. 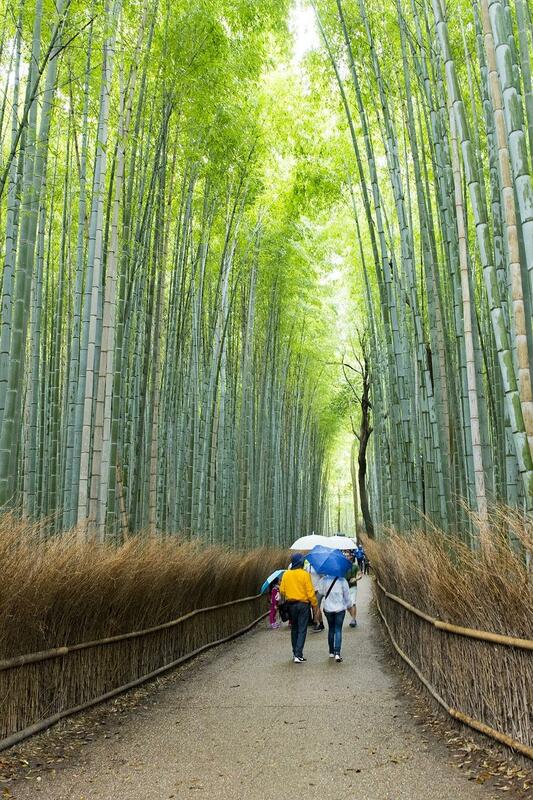 The forest is located in the district of Arashiyama, west to Kyoto, Japan. This bamboo forest looks very beautiful and also should be on the list of must visited place if you are visiting Japan. The most interesting facts about Sagano Bamboo Forest is the sound of winds when it blows amongst the bamboo trees. Also, the sound has been voted as the “one hundred must-be-preserved sounds of Japan” by the Japanese government. The railing on the sides of the road is made up of dry and fallen parts of bamboo trees. The forest is located in the Nevada Mountains of California. It is named after the tree Giant Sequoia which covers approximately the whole boundary of the forest. The forest covers the area about 4,829 sq. km. The United States is the fourth country with largest forest area. It is additionally known as Giant Sequoia by the U.S. National Forest that grows in 38 distinct groves within the boundaries of the forest. One of the beautiful forests is quite famous for the Giant Sequoia National Monument located inside the forest. Also, there are amazing notable places like glacier-carved landscapes and impressive granite monoliths. The forest was established back on July 1, 1908, from a portion of Sierra Forest Reserve. The forest is located in the Min Mountains of Tibetan Plateau. It is basically known for its lakes and waterfalls and also snow-capped peaks. The forest is both UNESCO world heritage site and a world biosphere reserve. The forest is famous for its beautiful landscape that accompanied waterfalls, lakes, verdant forests, mountains and last but not the least the folk customs of the Tibetan and Qiang peoples. The forest covers approximately 600 square kilometres (230 square miles) that have three valleys Shuzheng Valley, Rize Valley and Zechawa Valley. The Panda Lake Waterfall which I known to have the longest drop in Jiuzhai Valley and it will get completely freeze in winter. The best time to visit is autumn, especially between September and October. The forest is located outside Nowe Czarnowo, West Pomerania, Poland. The trees have a special shape here and it is believed that some end of the technique used to grow trees like that but it is still unknown. The forest has mainly Pine trees which make it come under most beautiful forests in the world. All the trees in the crooked forest are uniformly deformed. The area has all pine trees which were planted in 1930, However, all 400 pine trees grown with the trunks bent towards the north. All the trees of the Crooked Forest have the same 90-degree bend northward at their base but the exact reason behind this bend is still unclear. This is still a big mystery, however, it is believed that the trees must have been curved with the help of tool or technique but the exact reason is still unknown. It is basically a rainforest located on the northeast coast of Queensland, Australia. It has an area of about 1,200 square kilometres. It is the largest rainforest of the Australia continent. It is named after Richard Daintree who is an Australian geologist and photographer. The Daintree Rainforest is so beautiful that it has opted for movie Avatar for its ancient ferns, lush canopy and its ancient ferns. It has some of the unique plants and animals that cannot be seen anywhere. The Daintree River and Cape Tribulation are the main attractions of the forest. Also, Sir David Attenborough said about the Daintree Rainforest, “the most extraordinary place on earth”. It is located in the southern Sierra Nevada Mountains of California. The forest is known for its impressive landscapes. It covers an area of 1,193,315 acres. The amazing forest is famous for its world’s largest trees and has the greatest concentration of giant sequoia groves in the world. All the groves and the areas have been protected by the U.S. Forest Service. The camping option is available, however, you need to take permission from the authorities. The forest holds timber, water, forage, wildlife habitat, and recreation. Also, it is a popular hunting area for bears and mule deer. Travellers enjoy camping, skiing, snowmobiling, and kayaking. It is the largest rainforest in the world. The majority is in Brazil. It represents half of the rainforest of the whole earth. The forest has approximately 390 billion individual trees which are divided into 16,000 species making it one of the most beautiful forests in the world. The forest is additionally known as the Amazonia or simply the Amazon Jungle listed as the world’s largest rainforest with an area approximately 5,500,000 square kilometres. It accompanied the majority of the Amazon basin where all the area has been drained by the Amazon basin and its tributaries spreading across the Andes mountain range in the west and Atlantic ocean in the east. The forest cover is one of the least explored places on the Earth and it is believed that it is home to over 300 different indigenous and ethnic groups of people. The major part of the forest lies within Brazil, however, its parts also includes Peru, Colombia, Venezuela, Ecuador, Bolivia, Guyana, Suriname and French Guiana. It is one of the U.S. National Forest located in Washington. It covers an area of about 628,115 acres. It is inside the Olympic National Park. The forest is the wettest place in the whole United States. It is one of the most amazing forests of the United States. The forest protects a vast wilderness and different ecosystems that includes mountains capped with glaciers and its wild coastline. It was designated a UNESCO World Heritage site in 1981. The wildlife in the forest includes birds, deer, black bears, and the rare Roosevelt elk. You can also read about the oldest and beautiful trees around the world. These are the beautiful forests in the world. Do post your comments.